The Droids and Ewoks figure prototypes shown here are parts of what is one of the most incredible groupings of pre-production items ever assembled by a single person. That's right, these were all owned by the same guy at one time. Most of these pieces are hardcopies, but there are also a few first shots included, as well as what appear to be some internal first shots. Both produced and unproduced figures are represented here--this assembly takes in the full range of the Droids and Ewoks figure lines. Judging by the remnants of glue dabs on the bottoms of some of the figures' feet, these pieces might have been saved from some type of industry show, such as Toy Fair, where such painted prototypes are often glued to stands in order to allow for stable display. 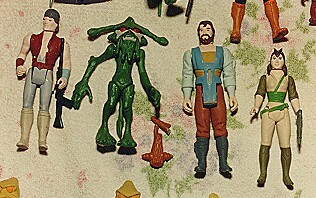 The above photo shows a produced figure, Jord Dusat, along with three characters from the never-produced second series: Admiral Screed, Mungo Baobab, and Governor Koong. Here we have, from left to right, Jann Tosh, Dulok Scout, another Mungo Baobab, and Kea Moll. This large group is comprised of, in the first row, the unproduced Chituhr, a second Jann Tosh, Uncle Gundy (painted in his production color scheme), and another Jord Dusat; and in the second row, another Admiral Screed, a third Mungo Baobab, Sise Fromm, a second Governor Koong, and an unpainted first shot of Logray. 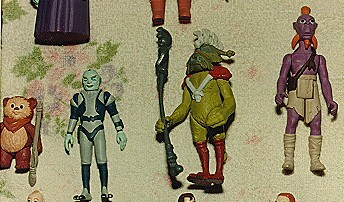 This photo gives us two unproduced figures, Weechee and Mon Julpa, as well as hardcopy examples of both the Dulok Shaman and (yet another) Jann Tosh. 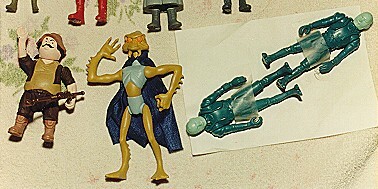 Here, on the left, we have two hardcopy examples of the unproduced Gaff figure. These are followed by a Kez-Iban prototype and a very cool example of Uncle Gundy bearing an early, unproduced color scheme. 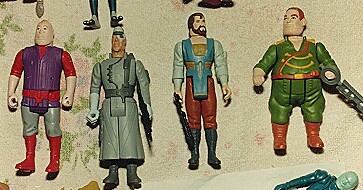 This one shows the same Uncle Gundy figure, along with the figures directly to its right--a third Gaff hardcopy and two unpainted first shots of the Tig Fromm character. This seventh image shows four prototypes of production figures. From left to right, we have painted prototypes of Wicket, Tig Fromm, King Gorneesh and Kez-Iban. The Kez, in particular, is interesting because its coloration is considerably different from that of its production counterpart, as well as the other Kez piece shown above. 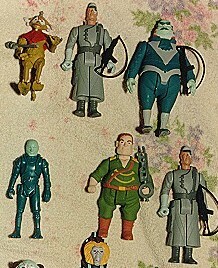 This last photo shows a wide variety of figure prototypes. 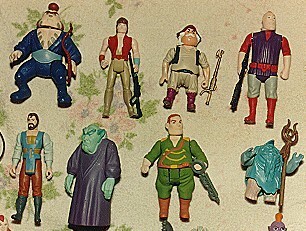 In the first row you see a hardcopy of the Urgah Lady Gorneesh figure, which is followed by a second example of the unproduced Admiral Screed. 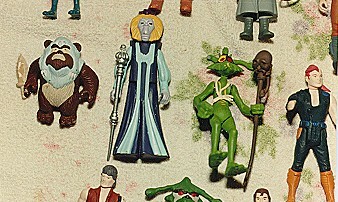 The third figure in the topmost row will likely be familiar to many collectors: its a pre-production example of Vlix, a figure released in small quantities in Brazil during the late-80s. In the second row we have a third unpainted Tig Fromm first shot, a third Governor Koong, and a third Admiral Screed. That's a lot of "thirds," especially when you consider that very few collectors can even claim to have one example of these extremely scarce prototypes. I think you'll agree that this is an amazing group of items.